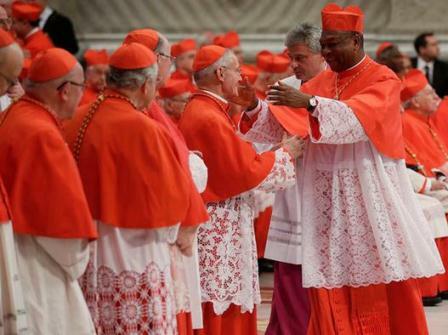 VATICAN CITY – John Olorunfemi Onaiyekan, 68, Archbishop of Abuja, Nigeria was one of the six new cardinals that Pope Benedict XVI named on Saturday, Nov. 24. The College of Cardinals is charged with the responsibility of electing the Pope as the Bishop of Rome and successor to St. Peter, the Vicar of Christ on Earth and the universal pastor of the Universal Church. A ceremony both joyful and emotional, the Pope reminded his congregation that the Catholic Church belong to people of all races and not just one group. The congregation, friends and families in the pew cheered and applauded as Benedict read each name in Latin. Among the newly elevated “princes of the church” at the consistory [cardinal-making ceremony] in order are: US Archbishop James M. Harvey, 63, Prefect of the Papal Household; His Beatitude Bechara Boutros Raï, 72, Maronite Patriarch of Antioch in Lebanon; His Beatitude Baselios Cleemis Thottunkal, 53, Major Archbishop of Trivandrum in India and head of the Syro-Malankara Catholic Church; Archbishop Ruben Salazar Gomez, 70, of Bogotá, Colombia; and Archbishop Luis Antonio Tagle, 55, of Manila, Philippines. Effective from the day of the ceremony, the elevated Cardinals don their new scarlet robes designed exclusively for their new identity and responsibility. They also received new symbols each including a gold ring, the skull cap also known as “zucchetto,” and the three-cornered red hat or biretta. Documents specifically stating the name of the cardinal’s titular church in Rome and their membership to the clergy of Rome were handed to the six Cardinals. The new Cardinals pledged to serve generously and professed love for God, his church and an absolute and unconditional love for their brothers and sisters even if it means shedding their blood in service to the church. “The fact that the Church is the Church of all peoples, and so she speaks in the various cultures of the different continents,” said Pope Benedict in his homily, and extended brotherly greetings to all who gathered in St. Peter’s to witness the solemn occasion from around the world and representing different cultures that form the universal church, highlighted. Archbishop Tagle choked up as he knelt before Pope Benedict to receive his biretta. He wiped his tears as he returned to his seat. Archbishop Onaiyekan was more jovial and chat with each of the dozens of Cardinals as he exchange the traditional peace-greetings that follows the elevation ceremony. In administering the oath to the Cardinals, Benedict XVI underscored “the supreme value of fidelity” which comes with their new responsibilities. In addition, he affirmed the image that the College of Cardinals has always been associated with an exclusive club in the Catholic Church. Anyone chosen to be a member is informally, at least, considered a potential candidate to be elected Pope and lead the universal church should the need arise. 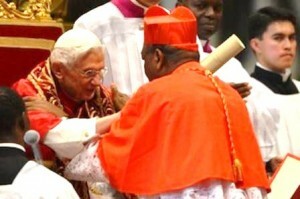 In earlier February, Pope Benedict also elevated 22 Cardinals who were mostly Europeans. The College of Cardinals is still dominated by Europeans even with the addition of the six new non–European Cardinals. Reportedly, 120 cardinals are under age 80, thus eligible to vote in a future conclave to elect a new pope, but more than half (62) are European. Vatican observers believe that the pontiff seeks to bring a more global, diverse and inclusive membership to the College. Critics say the “Clergy of Rome” no longer represents the Catholic Church that continues to grow in Africa and Asia, but faces crisis in many parts of Europe. Furthermore, the pontiff’s action aims to replace aging Cardinals (at age 80) who are excluded from entering the secret conclave and therefore no longer eligible to participate in the election of a Pope. “You must be prepared to conduct yourselves with fortitude, even to the shedding of your blood for the increase of the Christian faith, for the peace and well-being of the people of God,” stressed Pope Benedict. The AfricaPaper team welcomes Anthony Abdul Karim Kamara, Jnr. as one of its new reporters covering Africa and overseas. Good day! Do you use Twitter? I’d like to follow you if that would be OK. I’m definitely enjoying The AfricaPaper and look forward to new updates.